This is an introductory guide to Firefall battleframes, how you use them, how you upgrade them, and how you get new battleframes. Much of this guide will be old news to many of our readers, but we field enough questions about battleframes on a regular basis that we felt a complete Firefall Battleframes Guide would be useful to newer Firefall players. 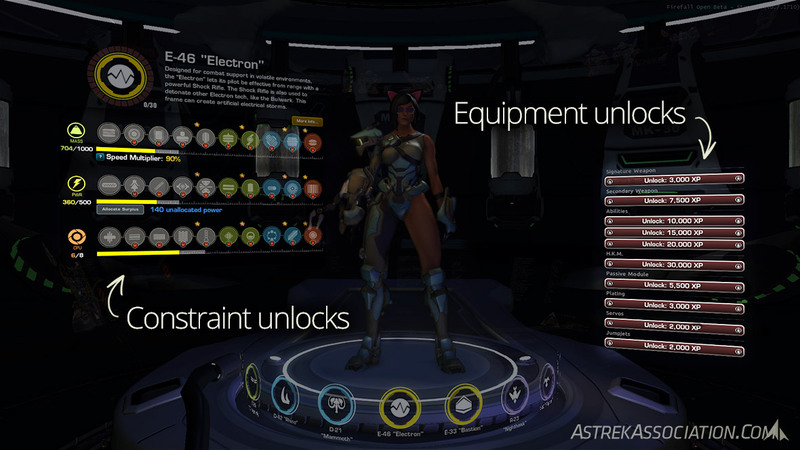 Battleframes in Firefall are similar to classes in other MMOs. They define the abilities you have access to, and the weapons you can use. 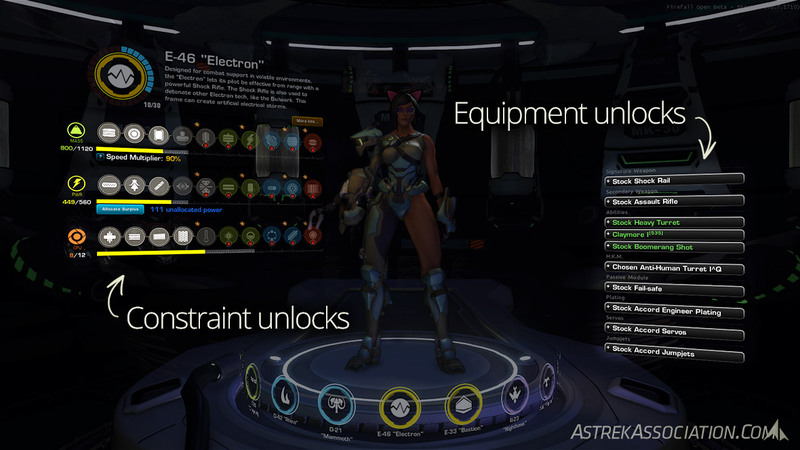 What makes Firefall’s battleframes different, however, is that you can switch between any battleframe you own whenever you like. Different battleframes have very different roles and playstyles, and learning to use your battleframes effectively is a key part of exploring Firefall. One note before we begin: although there are some battleframes with greater survivability, and some with healing abilities, this is not the kind of game where you need the MMO Trinity – tank, heals and DPS – to achieve anything. All battleframes can finish solo content just fine, albeit with different playstyles, and in group play every battleframe has something useful to bring to the squad. This section talks about all the available battleframes, what they do, and how they differ. There are five basic frame archetypes, and all battleframes fall into one of these types. There are at least three frames for each archetype: one Accord frame, and two or more advanced frames. The Accord frames are generalists and all-rounders, spanning the options available to the frame, while the advanced frames generally focus on a specific aspect of their archetype’s playstyle. We’ll take a quick look at all the battleframes here. The official site’s Battleframes section features a detailed look at each frame, too. It’s worth noting that advanced frames can equip any abilities, gear and weaponry that their Accord counterparts can use. For example, the Tigerclaw (an advanced Assault frame) can use the Accord Assault’s weapon and abilities as well as their own Tigerclaw-exclusive items. This allows the advanced frames to pick and choose from their own gear and Accord frame gear to focus strongly on a particular playstyle. Accord gear is very popular for this purpose. Just a caveat: as is usual in an online game, battleframe balance and gameplay varies as the developers tweak and fix the frames as they see fit. Accordingly, we’re discussing the overall theme of each frame here, rather than the current state of buffs, nerfs and overall power level for any particular frame. Assault frames are fast and AoE-intensive, with a lot of movement abilities and high damage output. Accord Assault: this frame exemplifies the Assault playstyle, and uses a Plasma Cannon (with a scatter-shot altfire) as its primary weapon. Tigerclaw: the Tigerclaw focuses more on single-target damage than the other Assault frames, and uses the Fusion Cannon (with a Nova Cannon altfire) as its primary weapon. Firecat: the Firecat is a very AoE-oriented Assault variant, and its attacks are fiery. Its primary weapon is the Thermal Cannon, with a triple-shot altfire. Biotech frames focus around healing and poison. They have strong AoE, and use a lot of damage-over-time abilities. Accord Biotech: this frame features some basic healing abilities and poison AoE damage. It also features a popular ability that makes reviving downed allies much faster and safer. Its primary weapon is the Bio Needler, a fast-firing dart gun with a short-range shotgun altfire. Dragonfly: this is a healing-focused frame, with a wide range of AoE heals that also deal damage to enemies in their area. The Dragonfly’s primary weapon is the Bio Rifle, a long-range autofire weapon with a short-range healing altfire. Recluse: this frame focuses on the damage side of Biotech’s playstyle, with a range of AoE poison clouds that linger around an area to continue damaging enemies. The Recluse’s primary weapon is the Bio Crossbow, a slow-firing high damage weapon with long range and a fast-firing minigrenade altfire. Dreadnaught frames are generally slower-moving than other frames, but they make up for this with high health and strong defenses. Accord Dreadnaught: this is a balanced all-rounder, with reasonable defensive and offensive abilities. Its primary weapon is the Heavy Machine Gun, a rotary machine gun with a spin-up delay, short range and very high damage. The altfire is a shield against incoming ranged attacks. Mammoth: this is the most defensive battleframe, with high-health plating and a range of defensive abilities. It’s also the slowest-running frame. The Mammoth’s primary weapon is the Heavy Plasma Machine Gun, similar to the Accord Dreadnaught’s weapon but with splash damage and bullet drop over range. The alt-fire doesn’t require spin-up time, with a slow rate of fire and a snaring effect. Rhino: this frame is more focused on damage-dealing; it’s less defensive than the Mammoth, and has greater mobility, as well as more damage-oriented abilities. Its weapon is a Heavy Laser Machine Gun, which has a longer range than the other rotary machine guns, with a single high-damage laser altfire. Arsenal: this is the first new frame introduced since Closed Beta, and is quite different from other dreadnaught frames. It’s lighter than the other dreadnaughts, with lower health and faster runspeed, and its abilities are focused around temporary use of a wide range of weapons with different effects. Its primary weapon is the LMG, or Light Machine Gun; it’s a non-rotary long-range machine gun with very little recoil. Its altfire is a slower-firing autofire that penetrates enemy shields. Engineer frames use deployable turrets and utility stations to deal damage and support their squad. Accord Engineer: this frame uses a mixture of offensive, defensive and utility abilities; like most Accord frames, it’s an all-rounder, although it doesn’t particularly excel at any specialty. Its weapon is the Sticky Grenade Launcher, which fires timed-detonation grenades. The altfire detonates all fired grenades immediately. Bastion: this frame focuses heavily on deployables, particularly turrets. The Bastion’s strength is area defense, and it is very popular for thumping. Its primary weapon is the Tesla Rifle, a short-range energy beam with increasing damage as it charges up – the altfire repairs deployables of all kinds (including many of the deployable Accord city defenses). Electron: this frame uses fewer deployables than other Engineers and focuses more on direct damage, although it does have defensive and squad support abilities. Its primary weapon is the Shock Rail, a medium-range energy rifle which fires quick electrical bolts and a detonatable AoE as its altfire. Recon frames are lightweight agile scouts, with fast runspeed and limited stealth abilities. Accord Recon: this frame features a bit of everything: enemy detection, short duration stealth, and a snare. Its weapon is the R36 Assault Rifle, a long-range assault rifle with a slower-firing scoped altfire. Nighthawk: this frame is a long-range sniper, with high damage and concealment from enemies. Its primary weapon is a bolt-action Sniper Rifle, with a slow rate of fire and a zoomable scope altfire. Raptor: this frame is, like the Nighthawk, also a sniper – however, it includes more squad support abilities. Its primary weapon is the Charge Rifle, with a zoomable scope altfire which deals increased damage the longer it charges between shots. This section discusses the different equipment a battleframe uses, what it does, and how to unlock it. This is your battleframe. There are many like it, but this one is yours. When you first open the Battleframe Garage (where you make all changes to your frame) on a new frame, this is what you’ll see. On the right is a list of the slots available to put equipment into, and on the left is the constraint progression area. 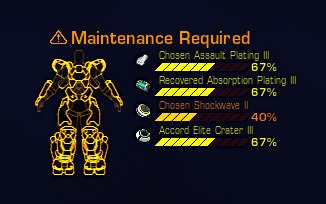 Your battleframe comes with 10 equipment slots, as you can see in the above picture. When you first acquire a battleframe, you’ll need to unlock these slots with XP to be able to put new gear into them, and some slots have no starting equipment until you unlock them. Here’s a look at the different equipment slots each frame has. Don’t forget that advanced frames can equip any abilities and gear that their Accord counterparts can use. To learn about how to upgrade this gear, see the “Equipping Your Battleframe” section below. Our Battleframe Modules Cheat Sheet lists all the frame-specific equipment available: primary weapons, abilities, HKMs and passives. This is the frame’s signature weapon. You can equip this (and put it away again) by tapping Q. Secondary weapons are generic and available to all frames, and help to cover for your frame’s weaknesses. (For instance, a frame with little in the way of AoE damage is well suited to using a Grenade Launcher secondary weapon.) The secondary weapons available are Assault Rifle, Burst Rifle, Submachine Gun, Shotgun, and Grenade Launcher. This slot is optional, and it’s empty until you unlock it. There are three slots for abilities; once you’ve unlocked them, you can switch the abilities around as you prefer. Each Accord frame has two available abilities that aren’t part of the default loadout. These abilities can only be acquired by crafting them, and can be fitted to all frames of the appropriate type. These abilities provide some variety, allowing you to customise your frame to suit your playstyle. The HKM is a super-ability that can only be used occasionally – you charge it up by dealing damage, taking damage, and healing. A charge bar appears under your abilities in play to show you how close your HKM is to a full charge; the charge will deplete slowly out of combat. This slot is optional, and it’s empty until you unlock it. The passive is an ability that you don’t actively use; it’s either always active in the background, or triggers automatically in response to a specific condition. Passives are generally designed to synergise with the playstyle of a particular frame. Plating determines your maximum health and health regen rate, and scales differently depending on your frame type. Servos determine your jump height (ie how high you can get before your jumpjets kick in) and run speed (which is an additional factor on top of your frame’s base run speed). Servos aren’t frame-specific, and can be equipped on any frame. Jumpjets allow you to move through the air, and better jumpjets have a greater total energy (allowing you to burn for longer) and regen energy faster. You can also airsprint using jumpjets by holding down shift to increase your speed, although your jets deplete much faster – better jumpjets have a lower energy cost for airsprinting. Like servos and secondary weapons, jumpjets are a common component that can be equipped on any frame. This section talks about improving your frame by spending XP on your constraints, and the resources and tokens you’ll need to do this. Once you’ve unlocked some of the equipment slots on your frame, it’s time to start thinking about improving your constraints as well. Improving your frame requires attention to both areas, so you’ll need to make some decisions about what order to spend your XP in. It’s important to note that all XP is battleframe-specific, so all progress you make on one frame (including unlocking equipment slots as per the “Anatomy of a Battleframe” section above) will only improve that frame. Mass: this is measured in kilograms (kg) and reflects the physical weight of gear you can equip. Gear that improves your mobility and your survivability tends to be very mass-heavy. Power: this is measured in kilowatts (kW) and represents the amount of power your frame can supply to your equipment. Weapons and abilities tend to be fairly power-hungry. CPU: this is measured in cores, and specifies the amount of processing power your frame can provide. By default, only ability modules (including HKMs) require cores, although this can vary with crafted gear. As you spend XP on unlocking constraint tech levels, on the left-hand side of the garage, your battleframe’s constraints will increase, allowing you to use gear with greater constraint requirements. The tooltip for each box will tell you the additional constraints (and other increases such as energy or pilot tokens) you gain for unlocking that box. People usually refer to their level of unlocks in the form of “Mass/Power/Cores” – for instance, a fully unlocked frame is 10/10/10, while a frame with Mass 8, Power 9 and Cores 7 would be 8/9/7. Sometimes people describe this as a total out of 30 (eg the 8/9/7 frame could also be described as 24/30), but this is less informative for frames that aren’t fully unlocked yet. In addition, most gear has a prerequisite to use it – this is a “bare minimum” constraint that you must have unlocked to be able to equip the piece of gear at all. You can see these prerequisites in our Equipping Gear Prerequisites cheatsheet – generally jumpjets, servos and plating require Mass unlocks, weapons and (most) passives require Power unlocks, and ability modules and HKMs require Cores unlocks. Actually unlocking the boxes has a progressively increasing cost of XP and crystite, and for later boxes you’ll also need some resources as well. In addition to the necessary XP, crystite, and resources, boxes 8–10 all require progression tokens to unlock. These progression tokens are unique to each frame, and you can craft them at the printer under Build > Battleframe Equipment > Battleframe Progression. Crafting a progression token takes 10,000 crystite, 5,000 of a specific resource, and four components which must be purchased using Accord Merit Points from a vendor. There are vendors in all four major cities, and you’ll need to visit different cities depending on which frame you’re unlocking. For more information on crafting progression tokens, including the necessary AMP components, check out our Progression Tokens Cheatsheet. We also have a Battleframe Progression Calculator which will tally everything you’ll need to progress a battleframe from your current status to your goal. This section discusses the different sources of gear for your battleframe, the differences between them, and durability and the need to replace equipment. All of your equipment can be upgraded far beyond the default gear you start with. Gear starts at the Stock level, which is the lowest level and only available as starting gear. Upgrades come in four Stages, which represent the relative overall strength of the item, with a Quality attribute (from 1-1000) which represents how good the item is within its stage. There’s some overlap between stages – so, depending on its stats, you may find that a high-quality Stage I item is better than a low-quality Stage II item. There are two types of reward crate you can get regularly, both of which provide items. Accord Prototype items: these come from the Item Crates awarded for logging in on day 4 of the daily rewards. Accord Elite items: these come from the Daily Mission Crates awarded for completing daily missions, and can also be given randomly as rewards for ARES missions and other dynamic events. There are Quartermasters in Copacabana, Thump Dump, Trans-Hub and Sunken Harbor. Each Quartermaster represents a different in-game corporation, and sells primary weapons. The weapons vary from one corporation to the next, as different corporations provide different gear specialties. For instance, Astrek weapons sold by the Quartermaster in Copacabana have high DPS, while the HelioSys weapons sold in Thump Dump buff one of your abilities. 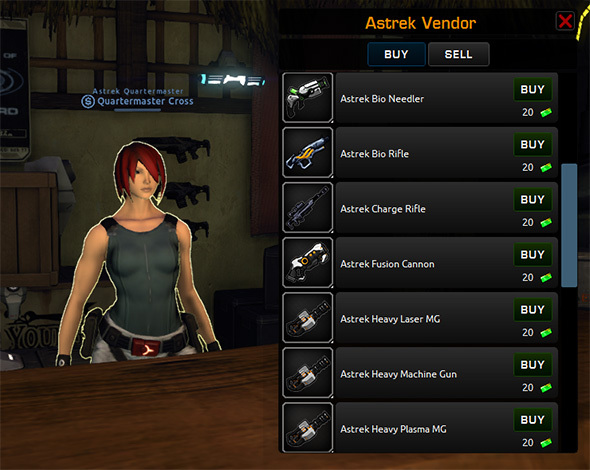 The Astrek Quartermaster in Copacabana also sells secondary weapons, although none of the other Quartermasters do. These weapons are equivalent to Quality 0 Stage II gear, although they have no prerequisites to equip them, and they can be purchased using city vouchers (which are earned by depositing Crystite Resonators at the city in question). Loot drops come from killing random enemies in the world; more difficult enemies generally drop higher-stage items. These loot drops can come in any Stage and any quality value. They come in several varieties, which have different attribute allocations – for instance, Chosen weapons have a higher damage-per-round, but slower rate of fire. Not all types of items are available in every variant. See the loot table at the bottom of this section for more information. Crafted gear is the most reliable way to gear up, but also the most involved. It gives you precise control over the stats on your gear, but it takes some attention to detail to get the most out of the crafting system. 1) You’ll need to unlock the recipe for an item by finishing the Base Research for the frame, which will unlock the recipes for all Stage I items for that frame. Stage II+ recipes are researched individually; you can find out more in our introduction to crafting research. 2) When you craft a piece of equipment, each component governs the value of a particular stat on the finished product, and adds more constraint requirements to the item. The higher the component’s quality, the greater its constraint requirements. Because of this, many people choose to craft components for stats they care less about at a lower quality, in order to leave more constraints for the stats they need most. 3) Be aware that at present, the crafting UI doesn’t correctly show you the stats and constraints on a component when you’re crafting it; you’ll need to slot a finished component into the item recipe in order to see its effect. This should be improved with the upcoming crafting UI changes. For more on crafting your frame’s gear, stay tuned for our upcoming crafting guides and tools. If you don’t want to go to all the effort of crafting your own gear, or hoping for random luck with your loot items and crate rewards, you can buy (and sell) almost all gear on the player marketplace, known as the ARES Exchange (AX). This can be accessed with the T key or by using one of the Marketplace Terminals in major cities. Accord Prototype gear can’t be sold on the AX; neither can the corporate weapons purchased from Quartermasters. It’s also important to note that once you equip a piece of gear it’s considered bound to you (even if you remove it before you leave the garage interface), and bound gear can’t be sold. When you’re buying your gear, you’ll need to pay particular attention to two things: the constraints the item requires, and the unlocks required to equip it. The marketplace UI doesn’t automatically show you whether you have the prerequisites to use an item when you buy it, so you’ll need to pay attention to what you can use. Each item has constraint requirements, and you’ll want to check the garage first to make sure you have enough spare mass, power and cores to fit it. For more help in this area, check out the Constraints and Progressing Your Battleframe section above, especially Unlocking Constraints. Like most MMOs, you won’t keep your gear forever in Firefall. You’ll replace much of your gear as you “outgrow” it, but even the best gear eventually decays and breaks, due to the durability mechanics in place. This is a two-pronged system. It doesn’t apply to stock gear, however – because stock gear is very low-powered starting gear, it has infinite durability and will never break. All gear (except stock gear) starts with 1,000 durability. This decreases gradually with every use of the item. In addition, every time you die and respawn (instead of being revived by another player) the gear equipped on that frame loses 100 durability. Despite the decreasing durability, your equipment will continue to function until it reaches 0. At that point, it breaks; it will work, but only barely – broken guns have a clip of 1, broken armor gives you a health of a few hundred at best, with broken servos you’ll move at a crawl, and so on. You’ll need to replace the broken gear at a garage. You can hold down the Tab key to see a little display of your gear’s current durability. Crafted gear has an advantage over the other forms of gear; it has a repair pool. This is effectively a durability ‘reservoir’ which can be depleted to refill the durability of your equipped gear. Loot drops, crate/mission rewards and vendor items don’t have a repair pool, so none of this applies to them – once you’ve used up their original 1000 durability, they’re done. Once your crafted gear has lost durability, you can repair it using the “Maintenance” button in the Garage. When you repair it, its durability will be topped back up to 1000 and the repair pool will be reduced by the same amount. You can repair at any time – you don’t have to wait for the items to hit 0 durability, and there’s no advantage to doing so. (In fact, there’s a disadvantage – you’re likely to be stuck out in the field with broken gear and no nearby garage!) However, once an item’s repair pool runs out, you can no longer repair that item and it will eventually break once it hits 0 durability. * – The plating variants include all Accord frame platings, plus Mammoth plating, but not include Arsenal or Rhino platings. Non-default abilities (those that aren’t unlocked by spending XP on a frame) don’t have loot drop variants; they can only be acquired by crafting. With the exception of plating, servos and jumpjets, items only have one loot drop variant; some items also have Accord Elite and Prototype variants as well. Biotech HKMs (Chemical Sprayer, Healing Dome and Necrosis) are the only ones with Recovered variants; all other HKM variants are Chosen or Surplus. Accord Engineer HKM (Anti-Personnel Turret) comes in a Chosen variant, but it has a different name: Anti-Human Turret. This section tells you how to unlock new battleframes. Everyone begins the game with access to the five Accord battleframes. However, there are two to three advanced frames for each archetype that you need to unlock if you want to play them. Unlocking a new battleframe costs either 100 , or 10 . Red Beans ( ) are an in-game currency purchased with RL money – you can purchase them from Red5’s website or in-game (hit ` to invoke your NavWheel, then choose Cash Shop > Currency Exchange). Pilot Tokens ( ) are a special in-game currency earned by spending XP on constraint unlocks. As you progress your existing frames, you’ll earn pilot tokens when you unlock boxes 5, 7, 9 and 10 for each constraint. You can earn pilot tokens on any frame, and spend them on whichever new frame you prefer. Fully unlocking a frame will earn you 12 pilot tokens, and you’ll only need to spend 10 to unlock a new frame. However, if you’re keen to unlock a new frame quickly, you’ll find it faster to play several frames to 5/5/5 constraint unlocks (which is worth 3 tokens) rather than play one frame all the way to 10 pilot tokens. Whew! And that’s the round-up on battleframes. As always, we hope you find it useful – if you have any questions, please let us know in the comments. WOW is exactly how I feel as well. Excellent job on this guide. Not to give you more work Siha, but maybe for a future guide you can break down the Battleframe Equipment Variants table a little further as to describe which gear drops for specific frames. Also, maybe show which stats the variants effect. You already do a lot of work for this site but I would love to see that because sometimes I have a hard time finding the difference between variances. I had wanted to do that kind of table for this post, but it turned out to be waaaaaaaay too unwieldy for this post. ;) I’m definitely looking at it for the future, though. Thankyou! This is excellent work. Thank you Siha for this excellent guide and for your awesome work in general. I have one correction though. I don’t know when it was patched or if it’s actually just a bug. But atm the advanced dreadnaughts may use the accord plating, which makes a lot of sense for rhino players and also for arsenal, though here the hp-difference is not that big. You’re right! That wasn’t the case when I was putting the guide together, so it’s a fairly recent change. If the dreadnaughts are going to have frame specific platings, then are the other BF’s going to eventually have their own as well? I haven’t heard anything about that; I’m not sure whether it would be necessary or not. Also they have removed the whole equipment unlock on the right hand side. I’ve been playing FF for a few days, this guide answered all the remaining quesions I still had. Hi, nice joint of info’s you’ve got here. Somewhat helped me out. The thing is, as the new patch has come out, it removed (or at least hid) the whole upgrade-to-get-points thingy, and thus i have no clue as to how i can get a new battleframe, without spending money. I currently have a lvl 8 Recon, and i “strive” to get the Raptor, but i honestly dont know how to get it, with the new patch. In order to get a new advanced battleframe without spending red beans…you can level any of the 5 basic frames to lvl 40 and you can unlock one advanced battleframe.